Mr. and Mrs. 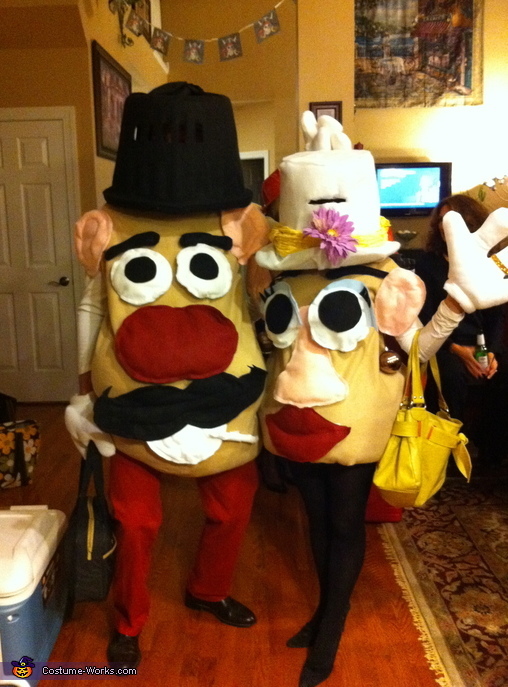 Potato Head costume. This costume was pretty easy to make, but a bit time consuming. I would be happy to share more details if anyone is interested! I would love some tips on how to make this costume!!! I Love it... so creative! Jessica I would love the details on how to make this please!! This is perfect for us! Happy to give some details! This is how I did it, but I'm sure a talented seamstress may have some better ideas. 1. Sew the body "sack." the width should be a few inches larger than the widest part of your shoulders. Length just passes the knees. For Mrs. P, I tapered the sack for a feminine shape. 2. Cut armholes and a head space in the sack. 3. Sew an open hem at the bottom and put the drawstring through it. When you wear it, the drawstring will tighten around your waist and the belly will blouse over. That's where the stuffing can sit. 4. Cut out face shapes and Velcro or sew to costume. 5. cover hats with felt and create eye slits. Attach baseball caps to help basket sit on head. Tips: try large pieces of foam to make hats...prob much easier! Also, If you want to be really creative, use Velcro for the facial features...people at the party can rearrange them in true potato head fashion! This is fabulous, you could even have extra pieces in a bucket for changing, so many options make it the perfect costume to reuse at a later date. Thanks so much for sharing.